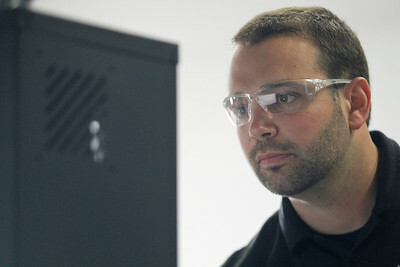 Matthew Apgar - mapgar@shawmedia.com Nick Priegnitz of Crystal Lake checks a monitor after testing his modified diesel truck on Tuesday, April 14, 2015 at Duramax Turner in Marengo. The truck recently set a record at the Texas Mile by reaching a top speed of 172.2 miles per hour. Matthew Apgar - mapgar@shawmedia.com Nick Priegnitz of Crystal Lake shows the engine of his modified diesel truck on Tuesday, April 14, 2015 at Duramax Turner in Marengo. The truck recently set a record at the Texas Mile by reaching a top speed of 172.2 miles per hour. Matthew Apgar - mapgar@shawmedia.com Nick Priegnitz of Crystal Lake buckles his seat belt as he takes his modified diesel truck for a drive on Tuesday, April 14, 2015 at Duramax Turner in Marengo. The truck recently set a record at the Texas Mile by reaching a top speed of 172.2 miles per hour. 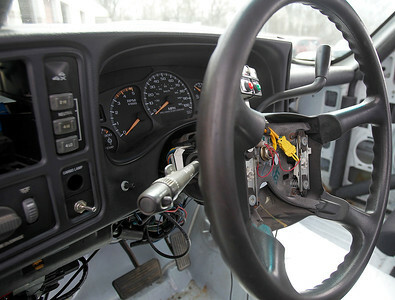 Matthew Apgar - mapgar@shawmedia.com The inside of the modified diesel truck shows the minimal parts used to keep weight low for a faster speed on Tuesday, April 14, 2015 at Duramax Turner in Marengo. The truck recently set a record at the Texas Mile by reaching a top speed of 172.2 miles per hour. Matthew Apgar - mapgar@shawmedia.com Nick Priegnitz of Crystal Lake drives his modified diesel truck on Tuesday, April 14, 2015 at Duramax Turner in Marengo. The truck recently set a record at the Texas Mile by reaching a top speed of 172.2 miles per hour. Nick Priegnitz of Crystal Lake shows the engine of his modified diesel truck on Tuesday, April 14, 2015 at Duramax Turner in Marengo. The truck recently set a record at the Texas Mile by reaching a top speed of 172.2 miles per hour.